Understanding the difference between sling types allows for operators to make smarter choices when working with lifting gear. Using the wrong equipment will most likely cause injury to employees and property. Below, we will highlight different sling types for easier shopping. Type 1 (Polyester Triangle Choke Sling): this type is like a standard type 2 triangle sling because they both have steel triangles that are designed to prevent wear and tears , which significantly extends the life of a webbed sling. Triangle choker web slings differ from type 2 slings because they have larger, slotted triangles on an end that allows the sling to work as a choker hitch. Type 1 slings are versatile, and so they are a very economical rigging supply. Type 2 (Triangle Sling): these polyester slings are typically used for vertical hitches or basket hitches. When a choker hitch is needed, type 1 slings are a better choice. Triangle polyester slings are great alternatives to eye and eye slings because ends are fitted using steel triangles. Aluminum triangle slings are also available. Type 3 (Flat Eye and Eye Sling): these slings are rather versatile because they can be used in a variety of hitch types. These slings also are made in various widths and thickness. Type 4 (Twisted Eye and Eye Sling): these slings are similar to type 3. The main difference is that type four has a twisted design. Twisted versions are best used in basket or choker hitches. Type 5 (Endless Sling): these are the most versatile web slings because they can be used in all three common hitches. These slings are also referred to as continuous loop slings. The slings are formed through joining ends of the webbing with a load-bearing splice. This type of web sling is economical and durable. For more information on the above sling types, please give our team a call. 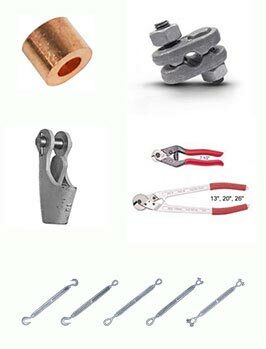 We offer a wide range of web slings and other rigging supplies.